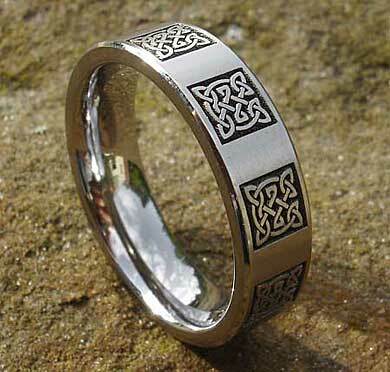 Men's Celtic Titanium Ring : LOVE2HAVE in the UK! 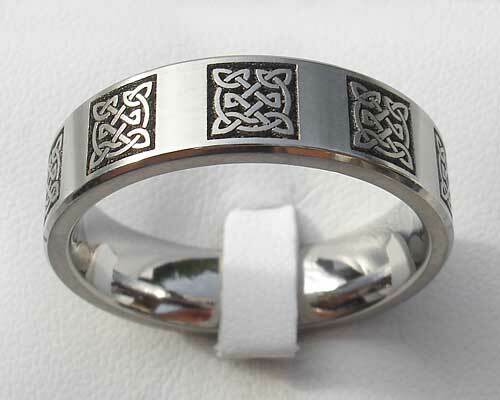 An intricate, laser engraved, flat profile men's Celtic ring made from titanium with chamfered edges featuring a Celtic knot design repeated around the outer of the ring in a panelled design arrangement. The pattern appears in these panels of up to ten times, depending on the size of the ring ordered. The designer has advised us that the engraving for this ring takes an hour to complete. The engraved surface itself is quite textured, therefore adding to the ancient Celtic symbolism depicted. The ring's width is 7mm, and it is available in a satin or polished finish. 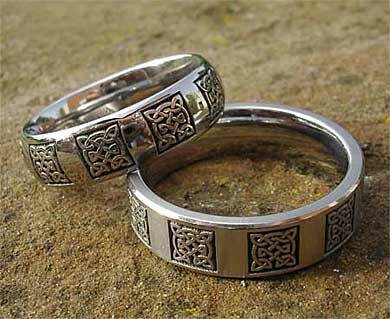 It is pictured below in both a flat (as featured on this page) and a domed profile for a Celtic wedding rings set. The domed profile version of this ring is also available on our website in this section.